White paper on crime 2001 Part 2/Chap.3/Sec.3/4. Table II-9 shows the number of defendants sentenced to fines in the first instance trials (including summary orders) in 1999 and 2000. 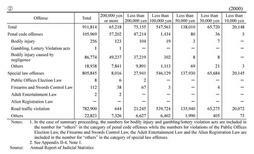 The number of defendants sentenced to fines of less than ¥50,000 accounted for 25.8% of the total in 1999 and 24.6% in 2000. The number of those sentenced to fines less than ¥100,000 accounted for 87.1% of the total in 1999 and 84.6% in 2000, and most of them (98.8% in 1999 and 98.6% in 2000) were for road traffic violations. The number of those sentenced to fines ¥200,000 or more accounted for 6.0% of the total in 1999 and 7.2% in 2000, and about 75% of them were for bodily injury caused by negligence in both years. By type of offense, 88.3% in 1999 and 85.9% in 2000 of the total defendants sentenced to fines were for road traffic violations, followed by bodily injury caused by negligence (7.8% in 1999 and 9.5% in 2000).